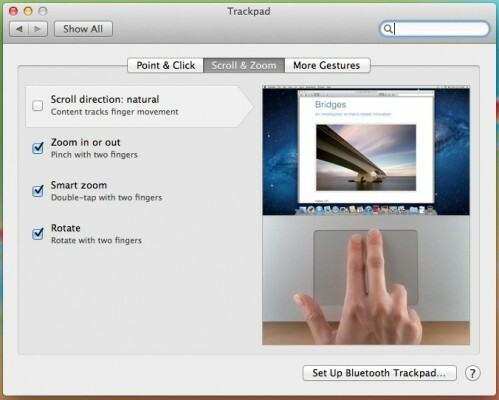 Apple’s introduction of “natural scrolling” with OS X Lion was a controversial move. Apple effectively decided that computer users had for years been scrolling the wrong way around. They changed things so that, by default, OS X Lion users would “push” content up to move it up the screen, and “pull” it down to move it downwards – the same way that everyone scrolls on popular iOS devices. It’s hard to argue with the logic, but Apple clearly realised that some people would find it hard to change a lifelong habit. They presented Lion users with the option to change things back to the old way via OS X’s System Preferences. I have to admit that I am of those stubborn old-fashioned users. I gave it a day, but having scrolled the traditional way for near-on twenty years, I was quite happy with the way things were. The other day I was surfing the Web on my iPhone and I remembered that I could reconfigure my Mac to scroll in the same way. I changed it to “natural” for a while, but, once again, I struggled to get used to the change – even though it does feel perfectly natural on my iPhone. It wasn’t long before I again reverted back to the “unnatural” configuration. This got me thinking. I wondered whether natural scrolling on a Mac had caught on with the masses – so I made it my business to find out. I asked the question on a popular Mac forum and collated the results. From my mini survey, I ascertained that while most people acknowledged that there had been a learning curve, 71% of the responders now use natural scrolling on their Macs. It’s perhaps worth adjusting the figure downwards slightly as Mac forum members are likely to be enthusiasts, but even with this adjustment, the indication is that people have largely taken to Apple’s new way of doing things. The people not adapting to natural scrolling all gave similar reasons. Some simply preferred the old-fashioned way, and others commented that while the natural scrolling feels natural on a track pad, it feels wrong with a mouse wheel. Others (and I count myself in this camp) also use Windows computers regularly, and have difficulties switching back and forth. The results of this (admittedly rather small) survey seem to suggest that Apple got it right with natural scrolling, and proves that Mac users aren’t resistant to significant change. I, however, will be sticking with the way things were. I’m old school.